I was up in Joburg the other day, and took the opportunity to have some fun at Zwartkops with BMW. About 4 years ago I had the opportunity to do the Audi High Performance Driving Course. At the time they had courses which they offered around SA. So when they came down to Cape Town I was given the opportunity to join them at Killarney. This was an amazing time, and at the end of the day, my (as of yet unrealised) dream of being a rally drive was reinforced. Last year I wanted to do a course again, and looked to Audi as they would often travel to Port Elizabeth to do a course there. Sadly their relationship with the Four Rings Academy came to an end, meaning that the only way I’d be doing a course was if I managed to get up to Joburg. Something that doesn’t happen too often in my life. Jump to this year, and all of a sudden I had an excuse to travel to Joburg. Naturally I looked around a bit. Mercedes and BMW both offered courses in the area. Mercedes only had a full day course (roughly R4,500), but they weren’t offering it on the days I was going to be in Gauteng. 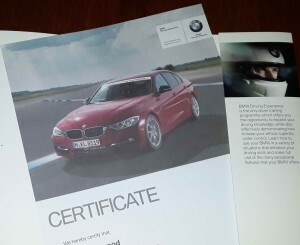 BMW offered several different courses, the most appealing being their High Performance Course (also an Advanced HP course which includes a few hours on the skidpan) and luck would have it they were offering it on the exact day I had free in Joburg. I was supposed to do the course with my girlfriend, but sadly her work decided to make her do other less exciting things, so I had to replace her with an old varsity friend for the day instead. The course is about R2500 (extra R700 for the skidpan, regretting that now), registration at 07h30, theory from 08h00, and you’re on the track in some form from 09h00-12h00ish. This entails four sets of laps, usually three or four laps each time. Standard fare on the course is a white, M trimmed BMW 335. You can opt for an M-course as well which gives you access to the M1, M3 and M5 (costs a little bit more, but only two people per instructor). Three people per instructor/car, and you take it in turns doing your sets around the track. In between sets they give a couple of demonstrations, from braking to launch control. The theory covered progresses from sitting position, through cornering, oversteer/understeer, some tyre info and finishes with a nice BMW promo-ad. The theory is both informative and also the basis for what they try to teach you on the track. Each session on the track they try to add a new element, requiring more focus, but improving your driving round the track each time. In comparison to what I did with Audi, the courses are virtually the same. Theory covered was identical, with a slight variance on the brake/turning balance noticed. Time on the course; Audi separated into sessions at the different corners, which then culminated with piecing all of them together in a few laps. Whereas BMW did sessions of laps at a time. I preferred the BMW method as it felt like less stop/start and was a bit more challenging trying to remember the whole track in one go (not that Zwartkops is particularly long). But seriously, as much as you learn and improve during the day, trying to be as fluid as possible through the corners, it’s just a blast. Great to do with a friend and have some good laughs. While I think the experience will be slightly different from instructor to instructor, I don’t think you can go wrong. I went in to the Audi course expecting to be able to drive like mad, and was reigned in. As such I went in to the BMW course with that expectation, but instead we were given what I felt was more freedom, and was able to give the car a good thrashing round the course. And the car takes it like a champ. These are stock 335s, straight off the shop floor, while it is a performance vehicle, it’s not specifically designed for the course, it has standard brakes and steering systems, but goes like a bomb. If you’ve ever thought about maybe doing a course, but the cost kinda put you off, go for it. You’ll have a great time. I have no regrets for either course I did. Both times I left, and all I wanted to do was get back onto the track and do more laps. It’s kinda addictive, always trying to push and, although you’re not actually timed, do a better lap than the one before. This entry was posted in Opinion and tagged BMW, driving course, high performance, zwartkops by Gareth. Bookmark the permalink.